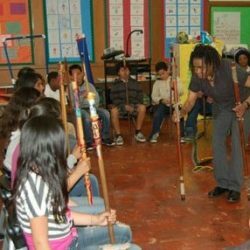 In this dynamic and uplifting workshop vocal artist, Melanie DeMore, will teach the basics of Gullah Stick Pounding. We will create a foot stomping, hand-clapping rhythmic community and combine it with singing spirituals and songs of protest and peace. Participants will learn about Gullah/Geechee culture through it’s dynamic music and rhythmic heart. We will, as a community, turn the whole place into a living, breathing drum. Suggested donation: $10 per person or $25 per family. Note: We’ll be making and decorating sticks for this event at our Welcome to our Welcome Back Orientation on August 31st.